The Choi Soon-sil scandal, and the subsequent impeachment of Park Geun-hye, are seismic events that are sending shock waves throughout the world. The scandal’s magnitude and bizarre nature are tempting many observers to connect it to other seismic political events around the world, such as the Brexit vote in the United Kingdom and the election of Donald Trump in the United States. 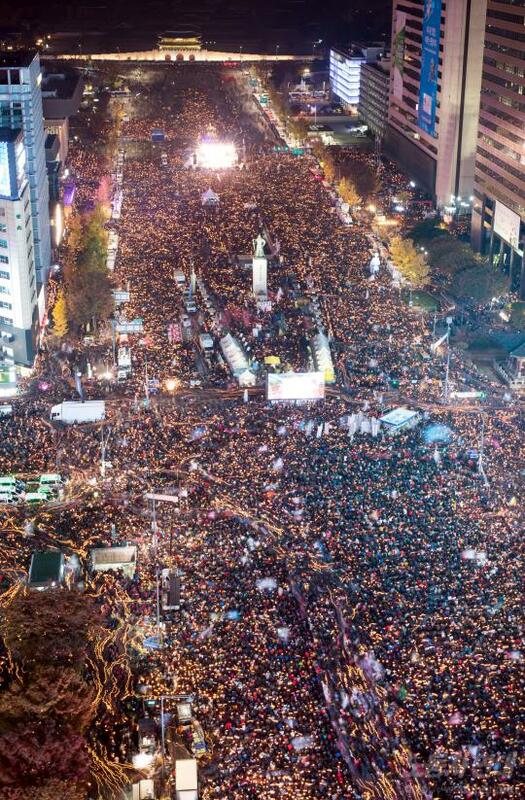 Seizing upon the massive weekly protests, the observers claim that the South Korean “people” are tired of the “status quo” and are now revolting against the “establishment.” By making this connection, these observers are trying to forge some type of grand theory of global politics, trying to capture a planet-wide zeitgeist of some kind. But this is all wrong—a lazy analysis that is totally ignorant of Korea’s recent political history. Korea’s reaction to the the Choi Soon-sil-gate does offer a real political lesson for the world, but not because it is the second coming of Brexit or another version of Trump. Just matching up the basic facts of these events reveals how facile this comparison is. Both Brexit vote and Trump election were fairly close affairs. Brexit vote was around 52 percent “leave” to 48 percent “remain.” Despite his campaign manager’s deluded claim of a “landslide,” Trump won with one of the worst margins of electoral college in U.S. history, and trailed Hillary Clinton by nearly 3 million votes across the country. In contrast, Korea is totally unified in its rejection of its president. The support for Park Geun-hye is around 4 to 5 percent, essentially a statistical error. The participants of Korea’s popular revolt are also completely different from those of either Brexit vote or Trump election. The victorious electorate in the Brexit vote and the Trump election is characterized as being rural as opposed to urban, less educated as opposed to highly educated, poorer as opposed to richer. Those differences do not exist in Korea’s rejection of Park Geun-hye—they cannot exist when 96 percent of the country disapproves the president. Further, the loudest voices in Korea that have been demanding Park Geun-hye’s resignation are not Korea’s equivalent of the “white working class.” They have been highly educated urban middle- and upper middle-class, who work in white collar occupations in the skyscrapers near the City Hall Square where there have been weekly protests of more than a million people. The triggering event for Choi Soon-sil-gate—namely, the fishy admission of Choi’s daughter into Ewha Womans University—captures this essential difference. Ewha, established in 1886 as Korea’s first modern school for women, is an embodiment of Korea’s “establishment.” It is an institution that prides itself in producing Korea’s women leaders. Three out of the nine First Ladies in South Korean history attended Ewha. An overwhelming majority of the names that would fill in the blank of “first Korean woman to …” belong to Ewha graduates. And it was the fury of the Ewha students and graduates over the fact that Choi’s daughter Jeong Yoo-ra may have gotten into Ewha based on favoritism that finally broke the Choi scandal wide open. Some shaman’s daughter fraudulently took the Ewha name was the basis of this fury. If there is any class element to Choi Soon-sil scandal, it is the reverse of Brexit and Trump election: it is Korea’s urban middle class raining scorn upon a lowly impostor. What, then, is the lesson that the Choi Soon-sil scandal offers? I suggest that Korean people’s reaction to the Choi-gate is not a reflection of the contemporary trend that gave us president-elect Donald Trump. Rather, what we are seeing in Korea now is the future of Trump. Korean politics already had its own Trump, and it is now showing the world what is going to happen next. I believe Korean politics runs ahead of the world politics. But because I am most familiar with the politics of my own country—the United States—let me stick with the U.S. politics going forward. Why does Korean politics foretell the U.S. politics? Because in the last 30 years or so, Korea as a country has been running at the forefront of the two major trends that have been driving the changes in the world, and in the United States: economic liberalization and the internet. These two trends create societal changes, which in turn create political changes. And Korea experienced those changes earlier than just about any country in the world, including the United States. What are the societal changes that arise from economic liberalism? Roughly speaking, in an economically liberal society, the government creates the conditions for the population to be educated and move freely to find jobs created by free enterprise. This leads to urbanization, as clusters of knowledge and skill—otherwise known as “cities”—engender greater level of efficiency and innovation, essential ingredients for participating in the global economy. Since the 1970s, Korea followed this script to the “t.” Korea set up a national public education system and steered its best and the brightest to become teachers by luring them with high wages. The best and the brightest graduates of those public schools usually moved to Seoul where the best colleges were, and settled there. In the boom times of late 20th century Korea, anyone with half an ambition left their hometown and moved to Seoul. Only those unable—people who couldn’t keep up at school, older people, people who were too tied to their hometown for whatever reason—remained. The changes in Korea occasioned by the internet have been equally dramatic. In what may be one of the most successful infrastructure projects in human history, the Kim Dae-jung administration, which ran from 1997 to 2002, heavily invested in providing high speed internet throughout Korea. Thanks to this prescient investment, Korea enjoys the world’s fastest internet, available throughout the country. This allowed Korean society to experience nearly all of the internet-related social phenomena around 5 to 10 years earlier than the rest of the world did. Social networking? Long before Facebook, Korea’s own social networking site Cyworld had 32 million users by 2002 in a country of 50 million people. Cyberbullying? Meet “dog poop girl” from 2005. Opinion echo chamber and fake news? Koreans have been living with it for more than a decade. I should offer a caveat here. Given that I gave a broad, two-paragraph sketch of modern Korean history, one can easily raise a number of specific facts about Korea that may appear to contradict these trends. Nor am I claiming that Korea has experienced all of the major world trends in advance. Korea, for example, has not experienced any meaningful racial strife, a major terrorist attack, or large-scale cross-border migration. But the overall point, I believe, is correct: because Korea has had around 10 to 20 years of head start in global trends, Koreans have been old inhabitants of the world in which Americans and Western Europeans are just beginning to find themselves. This world is, in essence, a world characterized by extreme sorting. People sort themselves into segregated spaces, both physically and virtually. The fault line runs urban-rural, more educated-less educated, young-old, forward looking-backward looking. Population of South Korea is 50 million, and nearly half of that population lives in the Seoul metro area. Seoul is one of the shining beacons of global economy, a nexus that connects Korea to the world. The city vacuums up Korea’s young talents by steering them toward its prestigious universities, and make them stay in the area by providing them well-paying jobs. At their jobs, Korea’s young and the talented produce the some of the world’s most advanced technological products. After work hours, they dress in hip clothes and enjoy the pop culture that leads the global trend. Korean government has done much to assist Korea’s rural areas, but it simply cannot reverse the tide of the times. Traveling from Seoul to one of Korea’s rural villages is not merely a travel of distance, but also a backward travel in time. There, few things changed since the 1970s, except that all the young people have left. The “young” people in those villages refer to people in their 50s, not in their 20s. The few remaining young men in those villages, bound to stay there to inherit the family farm, mail-order their wives from Southeast Asia because no young Korean woman wants to live there. Life there is a toil, and it is not sustainable in the long term. But everyone in Korea has high speed internet. Koreans were the first in the world to find out that greater availability of information did not lead to greater consensus; instead, it led to creation of information echo chambers in which people consumed information—real or fake—that confirmed their pre-existing world view. Politicians cynically exploited this new environment by “weaponizing” fake information, spreading easy-to-believe tropes through instant messenger apps and internet discussion boards. Distrustful of the media that wouldn’t report the “real news,” the Korean public would increasingly rely on their favorite channel of information from the internet, verifiability be damned. Obviously, Korean politics is not a blow-by-blow preview of the U.S. politics. That is simply not how history works. But the broad trends in Korean politics are largely similar to the broad trends in the U.S. politics, except Korea’s trends run about five to ten years ahead. This does lead to certain specific historical events that are startlingly similar. Tell me if this sounds familiar. A man of modest background first achieves upward social mobility through legal education, then enters politics as a liberal. Although he was not a well-connected political insider, he was a charismatic speaker who generated spontaneous fan clubs. The videos of his speeches would go viral on the internet, before the world even had the word “viral” to describe what was happening to him. Riding the wave of new and enthusiastic young voters, he prevails in a series of surprise victories in primary elections against a much more established opponent, and eventually becomes the president. Story of Barack Obama in 2008? No, this is the story of Roh Moo-hyun in 2002. The tenures of Roh and Obama unfolded in a similar manner. Both had legislative majority, but pissed it away by pursuing legislations whose necessity may have been real but not obvious to the public. (Roh with amending the National Security Act, Obama with the Affordable Care Act.) The legislative majority would vanish, pushing both men to rely more on personal charisma and executive fiat. In doing so, both presidents neglected to build up their parties in a way that would have structurally ensured the continued liberal rule. In the end, the legislative wipeout translated to their party’s defeat in the following presidential election. Except in Korea, this happened in 2007 rather than 2016. Pointing to the sluggish economic growth during the Roh Moo-hyun administration (during which Korean economy grew by “only” 4.2 percent,) Lee promised that Korean economy would achieve a “7-4-7” under him: 7 percent GDP growth, $40,000 per capita GDP, and G-7 economic power. Of course, none of this came to pass. To reinvigorate the local economy, Lee promised a massive infrastructure project—the “Grand Canal”—which was no more than a vehicle to transfer billions of dollars of government contract to his cronies in the construction business. The result was an environmental disaster that turned South Korea’s longest river into a neon green slush due to massive algae blooms. Lee’s older brother (himself a National Assemblyman) was arrested and sentenced to prison for bribery charges. Lee Myung-bak underwent a special prosecutor’s investigation for a suspicious real estate transaction involving the house in which he would retire. Lee Myung-bak was Korea’s Trump, Part One. Part Two began with the election of Park Geun-hye in 2012. Toward the end of the Lee administration, Korea’s liberals were feeling confident, because Lee was deeply unpopular. They bandied around the notion that the next election was “un-lose-able.” In response, Korea’s conservative doubled down on the “nostalgia” strategy by reaching even farther back into history. Did Lee Myung-bak—the symbol of Hyundai and the boom time of the 1970s and 80s—let you down? Wait till you see Park Geun-hye, the daughter of the dictator Park Chung-hee who ruled Korea during the 1960s and 70s! Korea’s liberals were apoplectic at Park Geun-hye’s candidacy. Here was a candidate who was antithetical to democracy. It was not simply that Park was clearly not the sharpest tool in the shed, prone to George W. Bush-like gaffes. It was that Park Geun-hye’s appeal as a politician was based entirely on the legacy of her father, a military general who came to power by overthrowing a democratically elected government by sending thousands of his soldiers to occupy Seoul. In the next 17 years, Park Chung-hee ruled by rigging elections, assassinating his opponents and executing protestors on the trumped-up charges that they were North Korean spies. How was it not obvious to everyone that the liberal candidate Moon Jae-in, a former labor lawyer who bravely defended ordinary workers who were accused of being North Korean spies just because they demanded better working conditions, was clearly the superior choice? As it turned out, there were enough Korean voters who did not care all that much about the democratic norms, just as much as there were enough Americans who did not care all that much about Trump’s obvious racism and sexism. Park Geun-hye prevailed with 51.6 percent versus Moon’s 48 percent, with a major assist from Korea’s spy agency. In a move that may have made James Comey jealous, the National Information Service operated a special division to interfere in domestic policy by posting millions of fake, conservative-leaning comments and tweets on the internet. As the Park Geun-hye administration began, the head of the NIS was prosecuted and received a suspended sentence—a slap on the wrist. Four years later, here we are: Park Geun-hye is impeached, with 96 percent of Korea disapproving her. Reviewing in the last 15 years of Korean politics suggests an answer to America’s most pressing political questions at this moment. Why do free people of democracy long for authoritarianism, and vote in authoritarian leaders? What are the damages caused by information bubbles, and how does one go about breaking those bubbles? How do you handle the electorate who simply do not care to know the truth, but live in their own, nostalgia-tinged version of reality? Outside observers may wonder why Koreans would ever long for the times of dictatorship. In part, this is because Korea’s conservatives have been “post-facts” for a long time. In the minds of Korea’s conservatives, Park Chung-hee was the hero who delivered South Korea from poverty to prosperity while defending against communism. In the minds of Korea’s conservatives who supported Park Geun-hye, the sham elections that Park Chung-hee put on were truly democratic and fair—just as much as the majority of Trump voters delude themselves into thinking that Trump actually won the popular vote that he lost by 2.8 million. Even if Park Chung-hee’s elections seemed a bit shady, why does that matter? Park was bold, his opponents feeble. Park got stuff done, while his opponents squabbled. Sure, he took power at gunpoint, but he was doing it for the country. Even the staunchest opponents of Park Chung-hee could not deny that Park led South Korea out of dire poverty. For those nostalgic for Park Chung-hee, that was quite enough. To Korea’s liberals, this concrete floor seemed impenetrable. Park Geun-hye supporters were old, set in their ways, and lived in their own information bubble. What is more, because of Korea’s falling birth rate, there are more older voters than younger voters for the foreseeable future. For several years into Park Geun-hye’s presidency, liberal politics in Korea seemed structurally doomed. Until suddenly, it wasn’t. In the aftermath of the Choi Soon-sil scandal, Park Geun-hye’s concrete floor melted away like it never existed. But how? 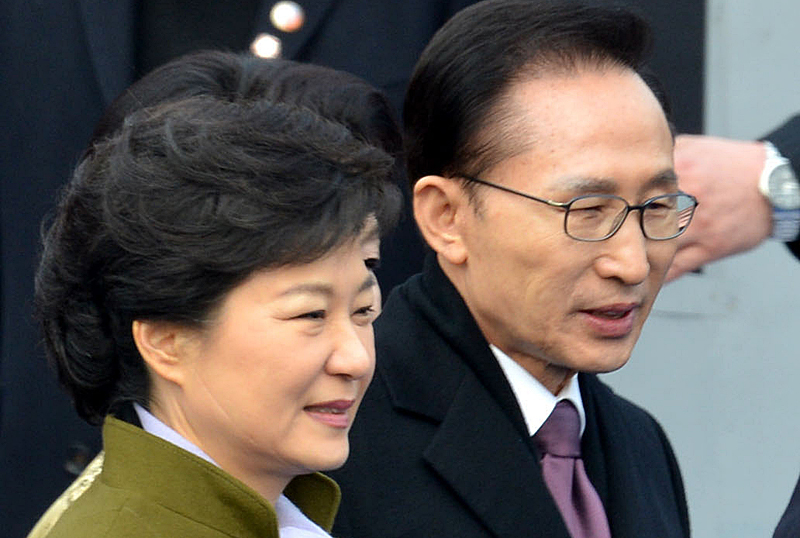 Corruption has been a constant presence in Korean politics. Every president in Korea’s democratic history—including Roh Moo-hyun and Lee Myung-bak—was investigated for receiving bribes, but not one of them suffered a 4 percent approval rating, coupled with weekly protests with million attendees and an impeachment vote. What was so special about this particular corruption scandal? My personal theory is: Choi Soon-sil scandal was just the right fact that destroyed the foundation Park Geun-hye’s appeal. It is important to understand that all politics is identity politics. Especially when it comes to the head of state, people vote for the leader who reflects their own desired identity. For Korea’s conservatives, that desired identity was Park Chung-hee—or more precisely, the mythical version of Park Chung-hee who was the wise philosopher king, dignified yet practical, powerful but not for his own sake. Although she may not necessarily be a world-class intellect, Park Geun-hye knew this at an instinctive level. Park Geun-hye actively managed her image to reflect the best version of her father—stoic and resolute, stately and above the petty political strife. Her best moment as the politician came in 2006, when a knife-wielding maniac attacked her and left a five-inch gash in her jaw while Park Geun-hye was campaigning for the provincial elections. After waking up from anesthesia after receiving 70 stitches, Park calmly asked the status of the campaign in Daejeon, a major battleground city. To be sure, there is something to be admired in this image of a leader. But this image does not necessarily include democratic legitimacy—which meant Korea’s conservatives had no issue electing a president whose primary appeal is the nostalgia for (the airbrushed version of) dictatorship. This drove Korea’s liberals crazy, because they could not understand why free people might fondly remember the times when they were not free. The liberals screamed and screamed: She’s the dictator’s daughter! She is governing like her father! Those cries did well to solidify the liberals, but hardly made a dent with Korea’s conservatives. Even when the Park Geun-hye administration literally killed someone—by aiming a water cannon directly at the head of a protester—conservative websites claimed it was a false flag operation, and Park’s concrete floor did not budge. But the Choi-gate was different, because it struck at the heart of Park Geun-hye’s capital asset. The president who was revealed through the Choi Soon-sil scandal was the exact opposite of the image that she so carefully crafted. Instead of being resolute, Park Geun-hye has been so feeble-minded that she relied on a shaman, and later the shaman’s daughter. Instead of being stately, Park cut a pathetic figure addicted to regular plastic surgery and prescription drugs. Instead of being above the fray, she got her own hands dirty by personally summoning the captains of Korea’s industries one by and one and ordered them to pay into Choi Soon-sil’s slush funds. Instead of getting stuff done, Park Geun-hye stayed in her residence and got her hair done as hundreds of school children were drowning on the Sewol ferry. All politics is identity politics, and the struggle to maintain that identity is what makes politics “post-facts.” In a world characterized by extreme sorting, it is easier than ever to be “post-facts.” The internet is a never-ending wellspring of tendentious falsehood that confirms your biases, and because of geographical self-sorting, everyone you meet offline agrees with you. The lesson from Choi Soon-sil gate is that facts matter, even in this post-facts world. It just has to be the right facts, the exact set of facts that strikes at the heart of the tribal identity people constructed for themselves. The tribal identity may seem like a formidable castle, impenetrable to reason, impervious to reality. But when the tribal identity runs into the right set of facts, you will be shocked to find just how fragile that structure always has been. Shouldn't it be "there were more older voters than younger voters" - not "there were more older voters and younger voters" ? Also, a minor point. As Aaron Blake stated in his Washington Post article, from Nov 15, and in another article (also from WP) from Nov 29, the reason that Trump lost the popular vote by so such a large margin was because of California. The number of votes for Clinton in that state is larger than her lead in the nationwide popular vote, so without California Clinton would have actually lost the popular vote. More importantly, the difference was because of California's unusual election this year - with no Republican candidate running for Senator in the general election. Blake estimates that, had there been a competitive election between a Democrat and a Republican for Senator in California, then Trump and Clinton would have tied for the nationwide popular vote. So Trump did indeed lose the national popular vote by a large margin, but it was due to the anomalous state of affairs in California. But why would you discount California, which alone holds more than 10% of the entire American population and about 15% of the country's GDP? Also, I haven't read Blake's article, which I intend to do shortly, but even if his extrapolation were to prove true (that had there been a decent Republican candidate running in California, more voters would have voted for Trump), I have to disagree with your rather far-reaching assumption that that would have equalized the popular vote. As anyone with a presence of mind can attest, this election has been one of the most polarizing in US history, and I can't imagine that 3 million people, let alone all Californians, would have jumped ship from Clinton to Trump because of a third party. I myself was very disappointed in both candidates, but as a resident of northern Virginia, another state that had no running Republican candidate for Senate, I wouldn't have changed my choice had there been one. Do you know why there was no Republican candidate running for Senator in the general election? Because hardly anybody voted for a Republican candidate in the primary. California, for the past few years, has had an open primary in which the general election is a run-off between the top two vote-getters. This year, they both happened to be Democrats - because the Republicans (and yes, they do still exist in California) didn't come out to vote in the primary. Why was that, you may ask? Because Donald Trump had already been all-but anointed as the GOP candidate. From my (admittedly limited) perspective on primary day, looking at the forlorn Republican voting booth sitting empty while there was a long line for the Democratic booths, it looked an awful lot like the stench of Trump was suppressing Republican turnout. Later, of course, the GOP held their noses and voted for him anyway - but blaming his loss in California on the lack of a Republican Senate candidate is bass-ackward. The "anomalous state of affairs in California" was due, at least in part, to the anomaly of Trump himself. "But why would you discount California, which alone holds more than 10% of the entire American population and about 15% of the country's GDP?" To convince Republicans to support CalExit! If California goes, the US President and the House will remain solidly Republican for the foreseeable future. Anyways, the point isn't that Californian votes should be uncounted for the 2016 presidential popular vote. It's just being demonstrated how a single state is able to skew the popular vote results. "Also, I haven't read Blake's article, which I intend to do shortly,"
Probably should have - some of your points are addressed there. "but even if his extrapolation were to prove true (that had there been a decent Republican candidate running in California, more voters would have voted for Trump), I have to disagree with your rather far-reaching assumption that that would have equalized the popular vote." It's not mine, it's Blake's. "I can't imagine that 3 million people, let alone all Californians, would have jumped ship from Clinton to Trump because of a [Republican senatorial candidate]"
Agreed. I don't see how this could happen either - but neither would have been necessary for Trump to have won the popular vote. We just need about half that number of Californian Republicans (say 1.5 million of them) to have come and voted instead of staying at home, and then the nationwide popular vote would have been a tie - even if Clinton still overwhelmingly wins the Californian popular vote. "... northern Virginia, another state that had no running Republican candidate for Senate,"
Well, Blake doesn't mention Virginia in this context. However, I feel that this comparison doesn't work, since the whole of Virginia had no running Democratic candidate for Senate, while California had two of them. So in California, Republican voters may have been less motivated to come out and vote in the general election while Democrats may have been more motivated, while in Virginia one might have expected both groups to have been less motivated. "I wouldn't have changed my choice had there been one." Again, no one who actually voted would have had to change their choice - IIUC, Blake's point was that most likely, the majority of Californian Republicans stayed home instead of voting for a Democratic senator. Re: Marc - I'm not an expert, but your counter-argument (that Trump's unpopularity with Californian Republicans is what caused the poor showing in the Californian primary and caused the failure of a Republican candidate to show up on the general ballot) seems like a pretty good one. The statement that the Park Gyeun-Hye administration literally killed the farmer seems quite hyperbolic. Was the police's use of water cannons unprecedented and/or ordered specifically by the administration? Why is it a scandal that Park has used plastic surgery in a country famous for plastic surgery? The korean media seems to be jumping over every tidbit and quirk that Park allegedly has, as in psychyatrists disregarding professional ethics through providing diagnosis of her mental state without having met her, the Korea Times writing on rumour-monging from politicians on Park's toilet habits! The post-truth bubble seems to go both ways at that, with many a Minjoo politician adding to hysteria through speculating on Park reintroducing martial law and other consipracies; such as the Sewol ferry being a ritual sacrifice doctored by Choi or Park! That is just loopy. Why not just focus on the more salient facts, such as the fishy foundations that were set up and the leaks of govenmental documents to Choi? Your first mistake is reading the Korea Times, a garbage of a newspaper that routinely reports on alien sighting. If you read a serious newspaper, you wouldn't ask this many stupid questions. As condescending as usual I see. I conceed that KT is a tabloid that isn't to be taken seriously, however the examples I provided are not made up by KT but also reported in the Hankyoreh as well as Joongang Ilbo. You still stand by the statement that Baek was literally killed by the Park Gyeun-hye administration? Of course I do. And if you read Hankyoreh and JoongAng, you would know why I say that. I still think it is tenous to claim that unless you can point out that the use of water cannons is a new occurence or that there were specific orders to crack down extra hard on the protesters. It is not as if the Korean trade unions have a history of completely peaceful protests, which is not to say that Baek desrved what happened or that the use of a water cannon was necessarily justified. Using your reasoning you could say that the Obama administration is responsible for all the infamous police shootings of African-Americans over the last years. Alleged connections between Sewol sinking and Choi Tae-min (http://mengnews.joins.com/view.aspx?aId=3026094) There is also A KT article which directly quotes the rumour-mongering of former opposition party member Moon Yong-sik (http://www.koreatimes.co.kr/www/news/nation/2016/11/116_217395.html. People's party and Minjoo party members speculating about Park's toilet habits, once again with direct quotations (http://www.koreatimes.co.kr/www/news/nation/2016/12/116_219834.html , https://www.koreatimes.co.kr/www/news/nation/2016/12/116_220295.html). I still think it is tenous to claim that unless you can point out that the use of water cannons is a new occurence or that there were specific orders to crack down extra hard on the protesters. Major Korean newspapers have discussed this issue and established an answer that is beyond reasonable dispute at this point. The fact that you keep making an issue out of this point indicates to me that you have not been following the news very closely. Fair enough, I won't badger you any more on that issue. I still feel that the alleged authoritaritanism of Park is greatly exaggerated and that the "dictator's daughter" trope is unfair and reeks of the mindset that seemed to punish people for their ancestor's crimes as with the Truth and Reconciliation Commission. On the merits of the more substantive allegations there is already political reason for Park to resign; however I find the conspiracy theories being floated crazy and the way that parts of the opposition act irresponsible. There seems to be enough to go after Park on the merits rather than going all out in a frenzy and attacking her over petty matters such as skin care regimens, toilet-related phobias and rumours of sacrificial rites related to Sewol. The death of Baek and the Sewol distaster are of course not petty matters and I don't mean to imply that. Anyhow, thanks for engaging and actually explaining why you think I am wrong rather than just mocking me for mentioning the Korea Times. Reading your take on the Choi Soon Shil scandal has given me a broader chronological perspective missing from most American newspapers. Thank you! Couple of things about reading the future direction of US politics from the past and present situation in S.Korea. I think there are two things that are very different between the US and S. Korea that makes such a connection hard for me to accept. 1. While S. Kore poured money into public education that made the populace rise up academically and economically, in the US the reverse seem to be happening. With the election of Trump and looking at his nominee for Education Secretary (a millionaire who is a staunch supporter of charter schools and school vouchers), I don't see the education situation for people in the lower rungs of the economy getting any better. The structure of education funding with property taxes segregates poor and not-so-poor extremely effectively. The fury of S.Korea over the fraudulent college placement of Choi Soon Shil's daughter is not something I can imagine happening in the US! 2. Immigration: Even if Trump manages to get the 'Muslim ban' enacted, that is really not a big slice of the incoming immigrant population. Two big economic immigrant groups exist at the extremes of the education spectrum. Students who come to attend college/grad school and stay on becoming permanent residents and citizens (all legal) and those who are brought on as guest workers, picking fruits and vegetables and who end up staying (legally or illegally). I don't see these two groups seeing any change. In between are your H-1B, L-1 visa workers mostly in IT. That category is unlikely change too. If the education level keeps falling because of #1 above, I only see more immigrants coming in to take up jobs creating more resentment towards immigrants, strengthening Trump-like leaders. I see a more inward focused US, not in a good way, and barring any major terrorist event (God forbid! ), not one that looks outward as S.Korea has done, and this makes me very nervous for the future. I see more parallels between PGH and Hillary Clinton (who is owned and influenced by jihadists as opposed to a shaman) than any correlation to Trump. I agree. Had Clinton been elected we'd be looking at a continuation of the failed and openly anti-semitic Obama administration as well as the inevitable scandals that have been part of the Clintons since their days in Arkansas. It is a bit premature to be making such predictions about the Trump administration especially considering we could have had a known felon in the White House had Clinton won the election. Thankfully, that didn't happen. I understand I risk being permanently banned from your blog by challenging you, but that comment taints an otherwise well written and informative commentary. Clinton is not a "known felon." AFAIK, never arrested for anything, never convicted, of anything. The only such allegations stem from conspiracy echo chambers on the internet, and the House Select Committee on Benghazi. And if you are just trolling for a response here, this will be my last. Well put, TK! I've finished reading your detailed write-ups on this historic scandal. I've thought about doing this elsewhere on my own, but the magnitude of the scandal has gotten so big that I gave up. So thanks for doing it on your blog! This Choi Soon-Sil gate (or, Park Geun-Hye Choi Soon-Sil - Samsung gate, as some newspapers say) is so unprecedented that it has overshadowed another equally disturbing yet overlooked scandal involved with Park's administration - Korea Parent Federation Scandal. Unlike Choi Soon-Sil gate, MSMs have barely covered on this, with exception of JTBC and other liberal newspapers. That's what disturbs me the most. I'm very happy to have an English translation from you. If I could read Korean as well as you write English, I would still read your blog. You pose some very interesting questions like, "Why do free people of democracy long for authoritarianism, and vote in authoritarian leaders?" My short response...it's easy to let someone else make the tough decisions. DEVO has a great song about this subject. Freedom of Choice. It's what you got. Freedom from choice. It's what you want. And ideas that make me stop in my tracks in fear. "...people vote for the leader who reflects their own desired identity." First, I have doubts about the integrity of any election of national size. If Trump did "win", what is it about him that people would like to reflect? Arrogance? Reckless ego stroking?